New visualisations have been released of the 90-metre-high tower Herzog & de Meuron is proposing in Stockholm, to replace a 1930s gasholder. The new images show more detailed exterior shots of the Gasklockan tower, which will be set in a landscape designed by Piet Oudolf. They also offer a first look at the designs for the interior. Herzog & de Meuron first unveiled its design for the building in late 2017. 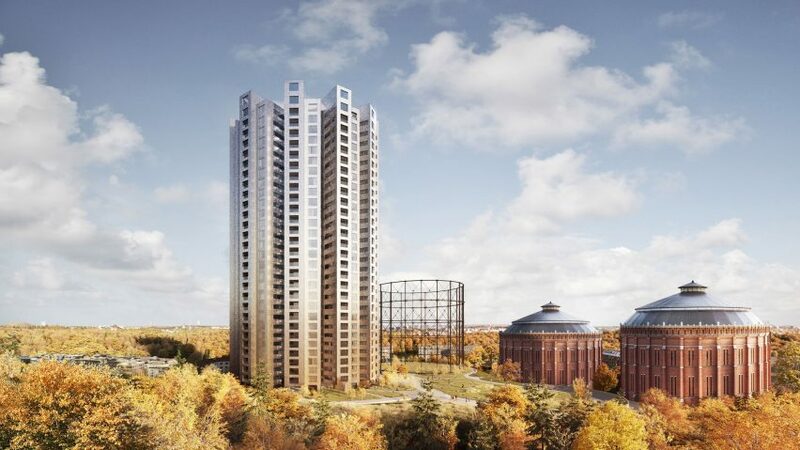 Backed by residential developer Oscar Properties, the 28-storey tower will be built on the site of a former gasworks in the northeast of Stockholm. The residential tower will contain 317 apartments on its upper floors. Its ground floor will house the reception space for the residents along with a deli, offices and an exhibition space. The tower takes it circular shape, and its height, from a 1930s sheet-metal gasholder that previosuly stood on the site. It will be built alongside two brick gasholders that were designed at the end of the 19th century by Swedish architect Ferdinand Boberg. Although the housing block will be circular in plan, it will have a faceted facade, giving each apartment a V-shaped plan with bedrooms on one arm and living spaces on the other. "Gasklockan is our first project in Sweden and the first building with this shape," said Jacques Herzog, co-founder of Herzog & de Meuron. "Its floor plan opens like the pages in a book to the surrounding city and landscape, maximising sun exposure and offering a variety of views. It offers a spatial experience not normally experienced when living in a tower." A wildflower public park created by Piet Oudolf, the designer of New York's High Line, and LOLA Landscape Architects is planned for around the Gasklockan tower and other existing gasholders. Construction of the block is scheduled to start this year, with the building expected to open in 2022. Herzog & de Meuron is not the only architect designing circular-shaped block on former gasworks. In the Netherlands, a group of cylindrical apartments designed to recall gasholders was recently completed by Mecanoo, while in London, Wilkinson Eyre has built a housing block within a trio of Victorian gasholder frames.